We kick this issue off with once again with a short editorial on teh front – and a metal arm prosthesis. Unfortunately the pdf fails to mention what the construction specifics (DC, spells required etc.) are and how it is supposed to be attacked to the respective person – via surgery? Just press it on the person? We don’t know. In a scandalous decision, the king seems to offer pardon to werewolves if they join his elite military units – a tad bit pulpy for my tastes, but could work fine, depending on how you manage to get the concept to your players. On the second page, we get a complex adventure-hook that is based on a man on the run and several grisly murders and one adventure hook that deals with a sudden infestation of spiders – both hooks have in common that they spell out too much for my tastes. By being more vague in the respective details, they could a) have been more creepy and b) more versatile. The deformed cambions of a wealthy merchant are working as slave labor in the city Zanderhorn and thus we get a new cambion trait. Sir Timothy’s emporium this time around sells a quill that helps making forgeries and we get a new horoscope for the month of Octombrie. The final page features the stats for the commander of the werewolf-brigade, but only his hybrid form and some public domain art. While the latter is all ok at this price point, the lack of stats for the other forms hurts the lycanthrope, as does the fact that his build is yawn-worthy: 4 Ranger levels, that’s it. Editing and formatting are ok, though not particularly impressive – I noted several glitches for such a short file. Layout adheres to the b/w-2-column standard and the pdf has no bookmarks, but needs none at this length. This issue has an issue – it’s imho actually better in presentation than #2, has less problems with its rules – but especially in direct comparison with #4, this pdf shows what it lacks. the spark of genius writing, this holistic sense of completeness and immersion evoked from #4. Instead we get somewhat disjointed ideas and hooks, which, worst of all, evoke one sense in me – a sense of boredom. Not one of the articles in this issue gripped me – they feel too plump, too obvious, too uninspired – especially the adventure hooks that spell out far too much. And making it known that you have a werewolf unit feels to me like a good way to lose any loyalty of your other soldiers and the populace. 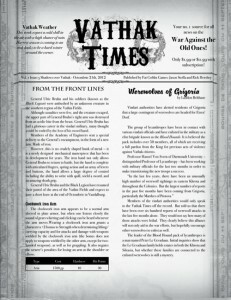 Not gonna happen in my campaign – secret ops would have been something different, but the article essentially makes their existence common knowledge. Reading this back to back with issue #4 is an almost painful experience, so big is the difference in evocative quality. While mechanically better than #2, I can’t really find any component article in this issue I really enjoyed, I’ll settle for a final verdict of 2.5 stars, rounded down to 2.